Atmosphere––Mr. Grixti does it very well. The bleak world inhabited by the narrator had been crispy fried by nuclear war. A blanket of smoke, dirt, and clouds blot the sun’s light, embracing every day in fallout winter. Lionel and his sister Claire are the central characters in the story, but things spice up with the introduction of Jessica, a gun toting firecracker wearing clean clothes. Lionel is conscripted to do a dirty job with Jessica, and if he survives, he’ll earn entry into New City for himself and Claire. Irony would be another great descriptor for Sun Bleached Winter. As Lionel and his sister struggle to survive in the wastelands, they also struggle to maintain the humanity that has been burned from the world. Is New City going to be a budding society, or just the shadow of what once was? Is it medicine that makes a society? Labor? Can it be defined as protection from the marauding hordes of cannibals? Does civilization depend upon which side of the gun you are standing? Beware of the dogs––the marauders sometimes use them to corner their quarry. Action is quite challenging to write. For the most part, I felt D. Robert Grixti’s execution of action was done with great agility as a first time author. As you saw, that last passage offered fantastic visualization. Most of the action in Sun Bleached Winter held tension, but in a few instances it faltered a little. Nothing to fret over, as Mr. Grixti evolves as a writer, those hiccups will pass. For the most part the editing was solid. There were a few words inserted that weren’t quite right. I found “Illegible” where it should have been “Unintelligible,” there was one or two other not-quite-correct words placed throughout the text. Another petty comment from me, the ending seemed a little over the top. I do not want to spoil the stories ending, it was very well plotted. Without saying too much, I still wonder if one character’s onset of madness was necessary in context to the greater picture. Read this tale, tell me if you disagree with that observation. I was still wearing a grim smile as I closed the book on this dark gem. All in all, I enjoyed this novella. 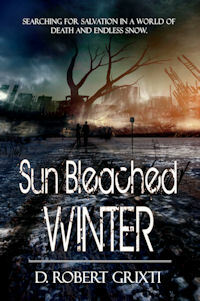 Sun Bleached Winter is a quick, fresh read, artistically written well enough to start fun dialogue between readers. I’d been given a copy of this novella in exchange for a balanced review.